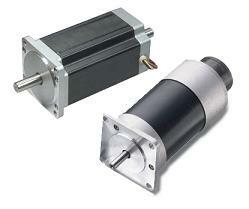 CNC motors are the heart of any CNC machine. The size and type of motor can define a CNC routers precision, speed, and accuracy. There are two primary classes of motors used on CNC machines, stepper motors and servo motors. Within these two classes there are several types. Stepper motors and servo motors both have their advantages and disadvantages which will be discussed in greater detail in later sections. The following sections will attempt to cover all aspects of the types of motors associated with CNC routers and other types of CNC machines. This section goes hand in hand with the CNC controller and Drive Components sections. This Section covers some terminology that is associated with stepper and servo motors. Review this section before proceeding if you are unfamiliar with terminology used when talking about motor performance. This section covers the advantages and disadvantages of each motor type. This section covers the inner working of stepper motors. Breaking down the parts and showing how they work together to create a unique motor. This sections covers the different types of stepper motors and looks at the advantages and disadvantages of each. This section covers the inner working of servo motors. Breaking down the parts and showing how they work together to create a unique motor. This sections covers the different types of servo motors and looks at the advantages and disadvantages of each.